Preview of EA Sports' NBA Live 2008 (NBA Live 08) coming soon! We will have cheats, screen shots, interviews, videos and more. 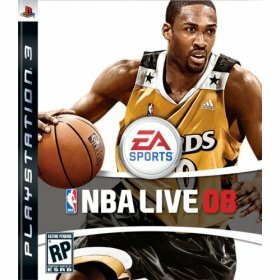 NBA Live 08 is expected to be released for the Xbox 360, Playstation 3 (PS3), Playstation 2 (PS2),GameCube, PC and Xbox. All-New Quickstrike Ballhandling: Whether you're pushing the ball upcourt or backing down a defender inside, quicker, more responsive ball-handling moves allow you to break down opponents and take complete control of your game with the right analog stick. Own the Paint: Put the ball in the hands of your big men and go head-to-head in the lane. With all-new moves and counters, including pump fakes, drop-steps, and spins, post play has never been better. See Who's Hot and Who's Not: Using actual NBA shot tracking data, know who to feed and who to defend based on a shooter's Hot Spots, an all-new on-screen overlay showing you exactly where a player is most dangerous. Dominate with Your Go-To Move: Every player has a go-to move that they consistently go to when the game is on the line. Now the signature go-to moves of the NBA's best players have been realistically re-created to help you score when it counts. That patented step back jumper? A fadeaway with the big leg kick? If it's in the game, it's in the game. A New Look and Feel: 5-on-5 gameplay has never looked so good. Featuring enhanced player spacing and behavior logic in the half-court, upgraded passing and rebounding mechanics, and an all-new two player interaction engine. All-New Shooting Mechanics: From deep three-point shots well beyond the arc to 10-foot jumps shots in the paint, every shot attempt has been redesigned to provide more fluid, realistic results. Dunks and lay-ups are now assigned to the same button command making highlight reel plays even easier to perform. The NBA Goes Live: Player faces, team uniforms, and authentic arenas jump to life behind the power of next-generation game graphics. Whether you're working on your game in the revamped practice gym or playing in front of a packed house, feel what it's like to be an NBA superstar. Like Butter: Running at a smooth 60 frames per second, NBA LIVE 08 is as close as you can get to the court, without dropping dime for courtside seats.